Beginning the 2018 new year off right, the Beacon Pointe Arizona Office jump-started their Women’s Advisory Institute (WAI, pronounced “WAY”) Casual Friday Financial Lunches. The January theme was spring with fresh flowers incorporating the colors from the firm’s new logo! The topic of the first WAI Casual Friday Financial lunch was “Ins and Outs of IRAs” which was presented Beacon Pointe AZ’s Director of Operations, Brooke Jess, CFP®, and Wealth Advisor, Robyn Gerke. Brooke and Robyn shared information with the guests in the form of a PowerPoint Presentation, which included a handout for the women in attendance to take home. Following the presentation was a dynamic discussion about the opportune time for Roth Conversions and the various types of IRAs. 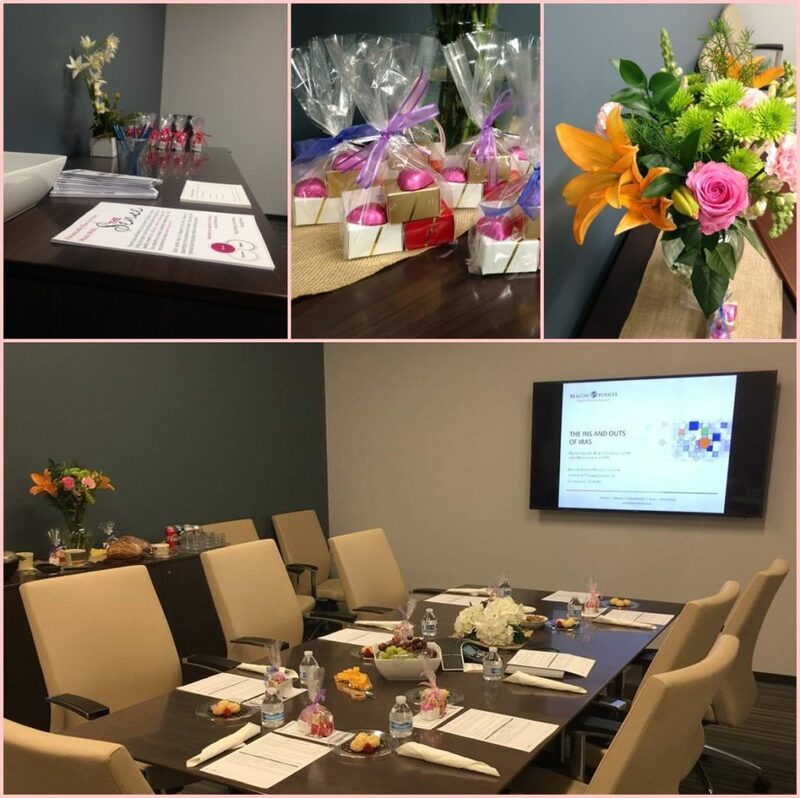 Event guests left with more knowledge and understanding of the topic of retirement accounts, enjoyed a bag of gourmet candies and additional materials on Beacon Pointe’s Women’s Advisory Institute and The Sense. February’s ‘Lunch & Learn’ theme was meant to honor Heart Health month and included pink decor and red ribbons and heart shaped candy. A dozen or so ladies were comfortably seated around the beautiful large conference room in the recently renovated Beacon Pointe Arizona office and focused intently on the presentation, “Understanding Investments,” presented by Rebecca Green, Financial Planning Advisor, along with Brooke Jess, CFP®. Women commented that they liked the discussion on stocks and bonds and the interaction between the guest and the speakers. Ladies walked away empowered with a greater understanding of stocks, bonds and portfolio allocations.